Start by clearing your garden of any debris, wilted shrubs, and weeds. Trim away the dried spent seed heads and flowers. Your garden needs to become a clean canvas before you can get to work on it. Top Tip: Keep all of the spent seed heads for the winter, as they will make a great snack for birds. Hoe all of your garden’s borders, as this help to reduce annual weeds before they develop into suffocating flowers and seeds. To reduce weed growth even further, pop down to your local garden centre and invest in a sack of Mulch. Mulch is excellent at retaining moisture and nutrients, plus it also acts as a fantastic weed suppressant. Definitely worth getting! Once you have de-cluttered your flower beds, dig out your trusty shovel and start separating your overgrown herbaceous perennial plants from other shrubs and floras. Herbaceous perennials are plants that flourish at the same time every year. The root of the plant can live beneath the soil all year round, making it a reliable bloomer. 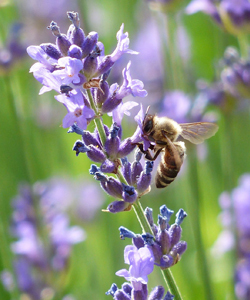 Lavender, Malva Moschata and Primula Veris are quite common garden dwellers. Replant in a new location and make sure to water them in well. Top Tip: This is also an excellent opportunity to move snowdrops to a new spot whilst they are still green (after flowering). Now that nitty gritty part is out the way, it’s time to add life to your garden. We believe that a garden should be teeming with wildlife and full to bursting with colour. Find countless flowers and shrubs in your local garden centre, especially foliage that can be planted straight away. Always read the growing instructions on the packaging for helpful tips. 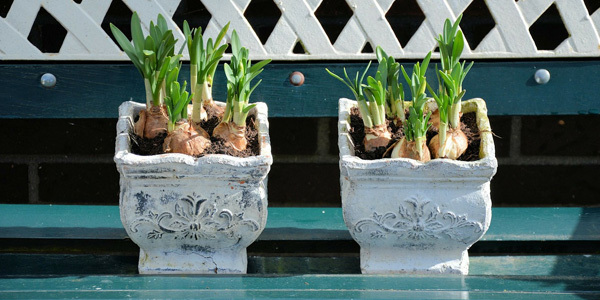 It may be spring, but now is the right time to start potting summer bulbs such as Lilies, Dahlia’s and Gladiolus. Store them in a greenhouse so that they can comfortably bloom in their own time. Once the weather warms up and the frost has passed, they can then be re-homed outdoors. Remember to tie in new shoots on climbers before they start to grow out of control. As many of you probably know, one of the best organic fertilisers that you can use is a box of Fish Blood and Bone. Plants love it, especially roses! It is packed full of nutrients to help your flowers grow. Simply spread it on the base (root area) of your shrubs, and slowly work it into the soil using a rake. The weather is perking up, so now’s the time to get out there and mow the lawn. Set your mower on a high setting and cut regularly. Not only will you have a tidy lawn, but your garden will be filled the smell of freshly cut grass. 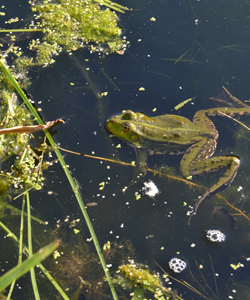 When emptying keep an eye out for frogs, dragonfly larvae and water nymphs. You can spot these by recognising their large thick dark bodies. Empty them into a large enough bucket with pond water and plants, along with any fish. Refill the pond once it has collected as much rainwater as possible. If you are using tap water, either leave it for 24 hours so that the chlorine evaporates or use a dechlorinating substance. Then slowly introduce your fish back into the water once it has reached the correct temperature. Re-pot any plants if necessary by using brand new aquatic plant baskets with a hessian lining. Top Tip: A pair of old tights will work just as well for basket linings as hessian. Last but not least, enjoy your garden. Find a comfy recliner and enjoy sitting in the garden with a hot cup of tea and lots of biscuits. Bees, Birds, Butterflies, Fish Blood and Bone, Flora, Flowers, Foliage, gardening, Home Garden, Mulch, Nature, Planting, Sewing Seeds, Spring, summer. Bookmark.